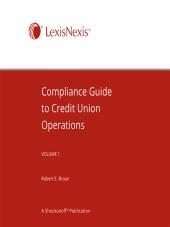 Written by Robert E. Braun, this guide provides comprehensive coverage of the rules that affect bank operations from the Operations Officer's point of view. Focusing on implementation from the operations side, this publication is ideal for an Operation Staff. 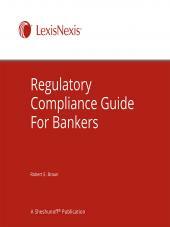 It's the comprehensive reference you need to keep in compliance with regulations. Compliance Guide to Bank Operations covers the rules that affect bank operations from the Operations Officer’s point of view. Instead of dissecting a regulation and looking for the connection to your area, this manual presents the regulated products from an operations standpoint. Each chapter covers a different product issue, such as Savings Accounts, Features of Savings Accounts, Notices, Disclosures, and Posters. 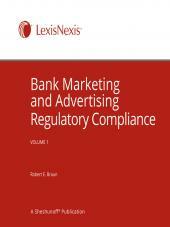 Each chapter provides step-by-step guidelines for complying with the rules that impact the product. The focus is on implementation from the operations side, so any member of the operations staff can access this comprehensive guide. You and your staff will always know where to look up answers to your operations compliance questions. Training can be more complete and systematic. And your entire operation will run more efficiently since you’re getting guidance from one reliable source. Robert E. Braun is an attorney in private practice specializing in federal banking regulatory issues. Mr. Braun has more than 20 years experience as a bank attorney. Formerly, he was in-house counsel to a major New York bank.